Home / Political News / Current News / Nepal in American priority? Dr. Joseph H. Felter, Deputy Assistant Secretary of Defense for South and Southeast Asia arrived Kathmandu on Sunday, 24 February. The same afternoon, he called on Prime Minister KP Sharma Oli and held bilateral meeting at the PM’s official residence in Baluatar. On Monday, 25 February, he called on Deputy PM and Defence Minister Ishwor Pokhrel. During the meeting with Pokhrel, Felter expressed the commitment for supporting Nepal in strengthening security management of Nepal. This is the visit of a high-ranking American official in a long gap of eight years. Earlier, it was believed that the US was watching Nepal from the Indian eyes. However, of late, the US has started to see Nepal from her own eyes, say political analysts. Recently, in one occasion, the US Ambassador had recalled that the US sees Nepal from her own eyes. After a long gap, Nepal’s Foreign Minister Pradeep Gyawali visited Washington as the state guest. Gyawali’s Tokyo visit and Japanese foreign minister’s Kathmandu visit, PM Oli enjoying the opportunity to address the Davos economic summit, visit of Indo-Asia-Pacific Command Admiral to Kathmandu are the recent developments seen in the diplomatic arena. These recent developments are related to the Wuhan summit between the Indian Prime Minister Narendra Modi and Chinese President Xi Jinping. Presently, India and China are strengthening bilateral relations in spite of the Doklam standoff in the past. Also, as economic giant China is aggressively expanding its investment in foreign countries through the Belt and Road Initiative (BRI), the Trump administration saw significance of Nepal like tiny country, say analysts. 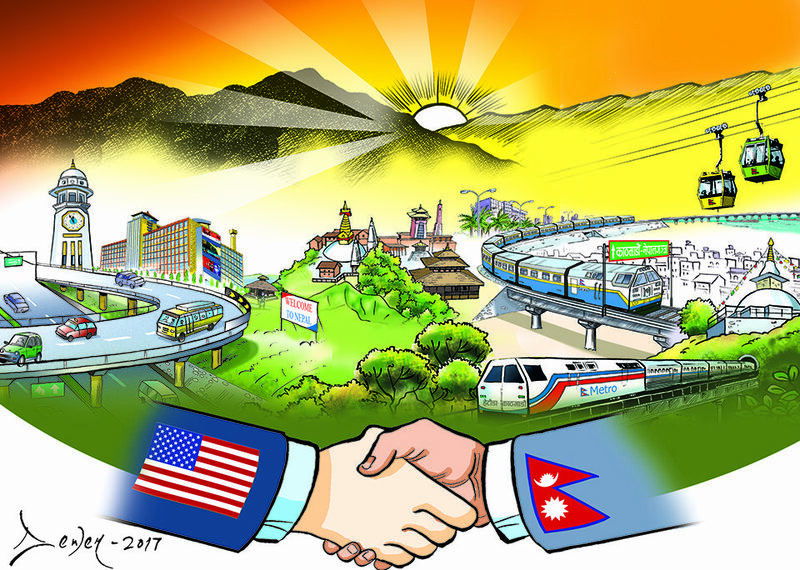 According to political analyst Arun Subedi, America and China are engaged in strategic and trade dispute. The western powers want to encircle economically emerging China even by using India, Subedi has explained in his write-up appeared in Ratopati Online news portal. “In a CIA document in 1949, Nepal was mentioned as the cockpit of Asia”, Subedi has cited. The US has understood Nepal as a nation having strategic significance and thus in the recent days, she has intensified her activities in this country, Subedi has argued. Our foreign minister was invited by the US and he was asked for working as a partner under the Indo-Pacific Strategy. At that cost, Nepal would get all kinds of support from the US, he has stated. Finally, he has concluded that Nepal is going to face crisis from ongoing tussle between the US and China. From Subedi’s remarks, it can be understood that if Nepal will fail to maintain its balanced diplomacy, she may lose confidence of both the neighbours. There is strong presence of the west in the political parties, bureaucracy, supreme court, Nepal Army, media and intellectuals. INGOs are running parallel government. The west, in a planned way, is mobilizing media, think tanks and other organs as well to serve its interests. Moreover, the former UML is the party run through the funding of the western INGOs. The current mission of the west is to institutionalize federalism, secularism and republicanism in Nepal. The second mission is intensifying the campaign of converging Hindu and Buddhist into Christian and more and more representation of the Christians in the state organs in the days to come. Thirdly, the mission is to stop Nepal from joining the China initiated BRI club. The question is whether the present government will be able to get rid from the western pressure or not! Previous Is Nepal heading towards another bloody revolt?